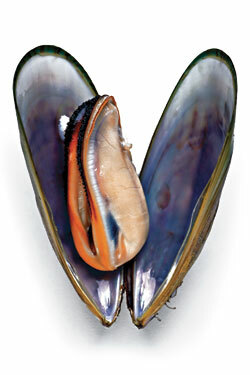 It would appear that the humble mussel has made something of a comeback since Anthony Bourdain vilified it in Kitchen Confidential nine years ago, saying he wouldn’t eat one “unless I know the chef personally, or have seen, with my own two eyes, how they store and hold their mussels for service.” But recently, the much-maligned bivalve has been redeemed by no less of a seafood scholar than Taras Grescoe, who has categorized the shellfish as one worth eating “absolutely, always” in his book Bottomfeeder: How to Eat Ethically in a World of Vanishing Seafood. Aside from mussels’ environmental advantages (they “clean the oceans and reduce the size of dead zones,” according to Grescoe), they also function as a bit of a blank—if slightly sweet and delicious—canvas for creative chefs, breaking out of the moules-frites rut to appear in such unexpected guises as a pizza topping at Motorino, as a potpie filling at Aloe, and in 23 various preparations at Flex Mussels, the Upper East Side spinoff of a popular spot on Prince Edward Island, the Canadian source of most of the rope-cultured specimens that end up on our tables. The fact that they’re cheap doesn’t hurt. Last year, the Lobster Place sold 9,900 pounds at the wholesale price of $1.75 a pound, versus 5,800 pounds in 2007, according to owner Ian MacGregor. And thanks to sustainable, chemical-free farming, there’s plenty more where that came from.